Robert the Bruce, King of Scots, was one of the most famous warriors of his generation. He eventually, along side of William Wallace, led Scotland during the first of the Wars of Scottish Independence against England. He fought successfully during his reign to regain Scotland's place as an independent nation. 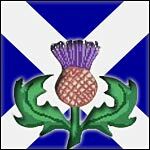 As we have known throughout history, William Wallace became the most valiant freedom fighter Scotland has ever seen. This magnificent two handed early Scottish Claymore has been appropriately named for its valor. This sturdy sword measures a massive 61” overall length. This Scottish Claymore has a blade handcrafted from high carbon steel and a forged crossguard and pommel of steel. A polished wooden grip completes the hilt of the iconic and impressive Scottish Greatsword. The Scottish Twisted Hilt Claymore has a Brass guard and pommel with twisted hardwood grip. The Wallace Sword, named for the legendary Scottish hero who battled the English in the 13th century. Double-handed sword, High-carbon stainless steel blade, Nickel Fittings. Wallace Single Hand Sword Based on the two-handed Wallace Sword. High-carbon Stainless Steel Blade and nickel-plated brass fittings. The Wood Handle Claymore Sword is a replica of the sword use in the highlands of Scotland by many a Scottish lad. Claymores were large two-handed broad swords that did a lot of damage to anything in the path of it.